This week's #PodcastPD brings you one of my passions - sketchnoting. 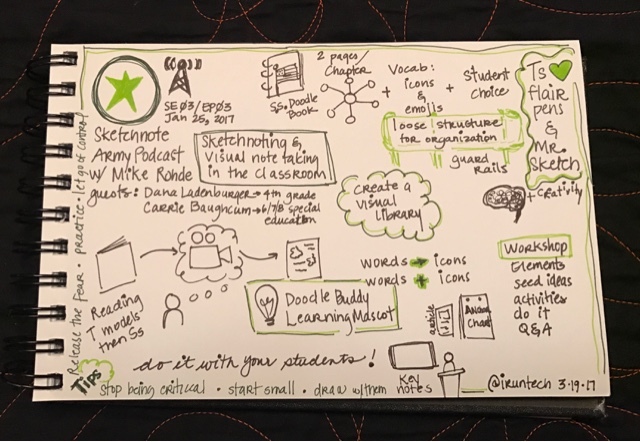 In episode 3 of season 3 Mike Rohde talks with teachers Dana Ladengurger and Carrie Baughcum, exploring how these two teachers bring sketchnoting into their classrooms with two very different approaches. My favorite take away was the idea of creating a Doodle Buddy or Learning Mascot - a partner in learning whose purpose is to highlight the most significant ideas. I'm looking forward to creating my own Learning Buddy. Or will it be a Doodle Mascot...I'll keep you posted. I challenge you to listen to the episode and create your own sketchnote! Post your pictures below. Podcast PD Week Three - What IS a Podcast?